He’s a dog who lived up to his name. Four years ago when Shu Li and her husband Kase brought home a Jack Russell Terrier puppy, they couldn’t have known that the dog they dubbed Kismet would someday survive a violent crime and become a hero in the process. “My husband picked it. It means destiny or fate,” Shu explains. It seems Kismet sure was destined to be taking a nap with Shu the afternoon July 15, 2015. The pair were resting in the bedroom when Shu heard the apartment’s front door open. At first, she thought it must be Kase was arriving home from work, but Kismet knew something was wrong, and started barking. As Shu tried to calm Kismet down a man walked into her room and hit her in the head with a heavy object. For a moment, Shu couldn’t believe what was happening, but Kismet knew what was going on and attacked the intruder, flinging himself at the man’s arms and legs. As Shu gathered her strength and tried to fight the attacker off, the bandana-wearing man pulled out a knife and stabbed her. Stunned, she pretended to lose consciousness and the attacker left the bedroom with Kismet still attacking him. “He distracted the guy and gave me the chance to run outside,” Shu recalls. As Shu rushed out the front door, the attacker stabbed poor Kismet before chasing after Shu, who was bleeding heavily. Thankfully, Shu made it down to the storefronts on the first floor of her building. She was able to get help and point out the attacker to witnesses, who got his license plate number before he drove away from the crime scene (he was arrested later that day). As the ambulance arrived, Shu’s thoughts were with Kismet. “I kept wanting to check on my dog, but I was too injured,” she says. Shu would not learn Kismet’s fate until she woke up in the hospital the next day, but was grateful when she did. Her husband — who had arrived home just moments after the attack — enlisted friends to rush Kismet to the vet. While Shu was having major surgery, so was Kismet. He was treated at Advanced Veterinary Care of Salt Lake City. “I’m very happy we had veterinary insurance,” Shu says, referring to Kismet’s coverage with Nationwide, which saved the couple from what could have been a very large vet bill. “The care we got was amazing,” Shu explains. 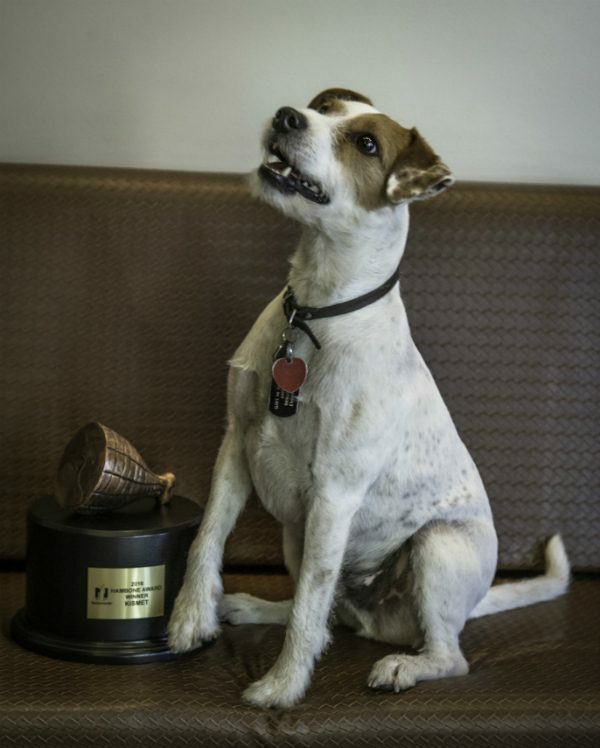 After hearing the details of Kismet’s heroic tale, Nationwide presented the terrier with the 2016 Hambone award, which honors the most unusual pet insurance claim of the year. 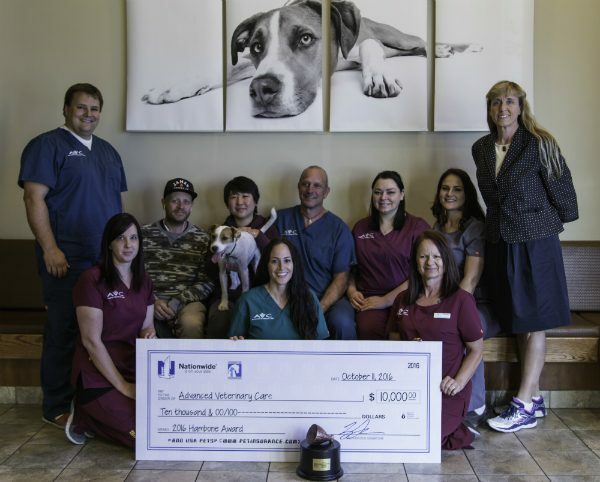 Kismet earned himself a trophy, toys and treats by winning the award, and the folks at Advanced Veterinary Care received a $10,000 award from the Veterinary Care Foundation, which will allow the clinic to treat pets whose owners can’t afford the care. Now fully healed, Kismet is not only a hero to Shu, but to other pets too. Shu says she’s grateful to Kismet’s veterinarians, as well as all people in Salt Lake City who offered support after the attack — including the anonymous person who paid for the high-energy terrier to attend doggy daycare during Shu’s recovery. “The support from the community was so great,” she says, noting that seeing supportive Facebook comments on news stories about Kismet always raised her spirits. Despite all she’s been through, Shu considers herself lucky and says her dog is pretty lucky too. The attack was not Kismet’s only close call. “He got parvo when he was a little puppy and he made it through. He ate onions later and he made it though that too,” she explains. Call it fate (or just good veterinary care) but Kismet survived his early medical issues so that he could be there for Shu the day that she needed him most. These days, Shu describes Kismet as being super healthy, and says he enjoys morning and afternoon runs at the dog park with Kase, and is still happy to cuddle with Shu at naptime. 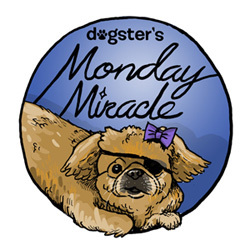 The post Kismet Saves His Human and Survives Stabbing appeared first on Dogster.